Service Management: Is IT in Trouble? Where is IT headed and how have recent events impacted the IT Service Manager? Has service management moved beyond the ‘start-up’ phase and into a quantifiable profession? This session is itSMF USA’s first opportunity to earn priSM CPDs in a virtual setting. All attendees who attend the full 45 minutes of presentation may file to earn 1 priSM CPD. 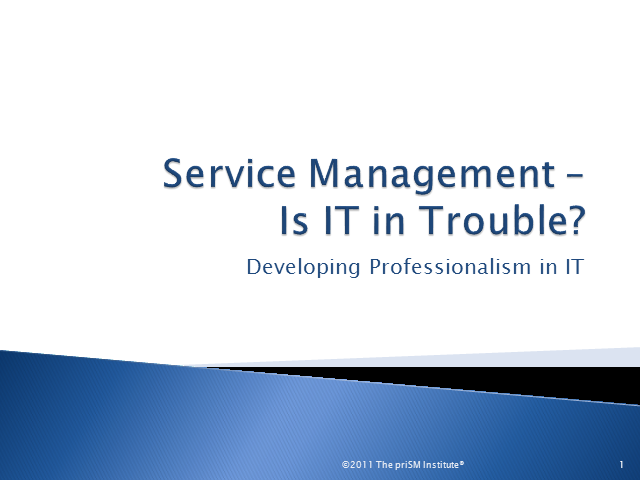 Title: Service Management: Is IT in Trouble?